Highlights of a 2003 interview with Skate Legend Russ Howell, originally posted at Old Man Army. In the mid 1970s Russ Howell was one of the world’s greatest freestyle skateboarders. From record breaking 360s to handstands, skaters on their polypropylene and solid wooden decks tried to emulate his moves. Russ appeared in 1970s skateboard films and along with people like Skitch Hitchcock and Ty Page was a big name when many of us “Old Men” started skating. Still skating today, Russ took some time out between snowboarding trips to answer questions from Old Man Army Forum members. Questions compiled by SteveS. RUSS: I began skating in 1958 during the age of steel. RUSS: I moved out of the Los Angeles area when a teaching partner of mine was shot and killed in the classroom. I quit teaching and moved to Boise, Idaho where we only have seven months out of the year to skate; the other five are spent surfing the mountain on snowboards. I skate all the time during the summer and enjoy freestyle, slalom, longboarding. I recently sold the halfpipe in my backyard due to an ankle injury. RUSS: The Dogtown movies center around the 1975 Del Mar Ocean Festival (Bahne/Cadillac Skateboard Nationals). Most of the Zephyr kids were 13 years old at the time and had been skating for only one year. There were many skate veterans at that contest including myself who had more than fifteen years experience. The Dogtown skaters were not prepared to compete in an organized contest format and went home with their pride hurt. Much of the Dogtown popularity came from Stecyk's fictional articles in Skateboarder Magazine about the group. There were many good skaters who contributed positively to the sport and somehow Skateboarder chose to promote a gang of kids who only sought to destroy the sport on an organized level. RUSS: Skateboarding existed before I began riding, and I started skating before any of the Dogtown skaters were born. For them to claim they invented skating or riding in pools is completely false. Skateboarder Magazine ran an article in 1965 on Pool Riding and that was around the time many of the Dogtown skaters were born. History depends upon who is telling the story. I was in Australia and asked Stacy to join me to help promote the sport there. He was very assertive and wanted more power in the sport. His accomplishments are many. His surfing documentary, Riding Giants is brilliant. His Dogtown movie leaves me confused to his motives. I can't understand why he chose to glorify a group of skaters who almost destroyed the sport. Skateboarding exists today not because of them, but in spite of them. RUSS: One of my college majors was Physical Education. The Olympic Games have always held my highest respect and it was a dream of mine to integrate skateboarding into that arena. My goal of elevating skateboarding into a highly organized sport was not shared with other skaters. Many who did not do well in competition wanted to keep skating undisciplined. They cared little about acquiring large financial sponsors or creating a positive public image. The sport decayed due to the high visibility of drugs in the 80's and the sport lost the financial backing to keep contests going. The X-Games offer a highly organized venue for skaters to aspire to. RUSS: Skateboarding offers something very unique to many individuals. Although I tried to rally for getting skating into the public schools and eventually into the Olympic Arena, I still appreciate the fact that it remains an activity without an authority figure telling you what to do. Skateboarding has many forms and anyone who attempts to dictate what is best for all only limits the sport. I hope my individual appreciation for handstands, spinning, slalom racing and other forms of skating would offer inspiration to others. Control is the foundation of all conflict and too many skaters have tried to influence the sport already with close minded comments. RUSS: The 1975 Del Mar Nationals attracted over 500 skaters from all over to compete during that weekend. Many of the veteran skaters from the mid-60's era showed up: Bob Mohr; Skitch Hitchcock; Ty Page and myself. The Zephyr (Dogtown) team was a group of young 13-year olds dressed in dark blue T-shirts which gave the appearance of a Boy Scout troop. They had only been skating for a year and obviously lacked the vocabulary of skills to compete in an organized freestyle contest. As a competitor at that event, I didn't give much attention to them because they were young and didn't offer much at the time. There were many other skaters there who deserved much more respect. RUSS: Stacy was riding for Gordon & Smith at the time he came to Australia. He wanted to move up into management, but G&S kept him only as a rider. Stacy's ambition would eventually lead him to form a company with George Powell: Powell/Peralta. Stacy and I always got along great and I have great respect for his riding ability. Stacy had very long hair at the time and he was often embarrassed when the kids would come up and ask when is Stacy going to show up? Where is she? Australia was the last time I saw Stacy. He has worked very hard to achieve his accomplishments. It is with great confusion that I question his motivation to make his Dogtown movie. What were you thinking, Stacy? Why stain an otherwise brilliant skating career? RUSS: I used to skate at the beach and one of the little kids that hung around was Jimmy Scott. He later became a sponsored skater, then was ranked #2 Pool Roller Skater in the World, and then won the World Snowboard Half-Pipe Competition twice. Jimmy gave me my first snowboard under the condition that I would promise to try it. He told me I didn't belong on skis – he was right! My skiing began when I was in the Air Force stationed in Denver, Colorado. My roommate and I used to go skiing every weekend. After 30 years of skiing, I switched to snowboarding and have never gone back to skis. Snowboarding did not come easily to me; I made every mistake possible and got slammed. I highly recommend lessons which I never took. RUSS: My hometown of Long Beach hosted the World Downhill Skateboard Championships. I tried riding the hill in a handstand and got up to 40mph. The problem came when I tried to put my foot down to stop myself from going through the intersection at the end of the street; I exploded. The asphalt road ate through my heavy coat and I was covered in blood. Another injury came after I woke up at a skatepark in Japan and didn't take enough time to wake up before dropping into the pool. I sprained my ankle but was able to finish off the month-long tour. That same injury resulted in two ankle surgeries many years later. My most recent injury happened two years ago while longboarding at high speed along the Boise River Trail during the Fall and damaging an ankle after slipping out due to wet leaves on the ground. Who would have thought that longboarding could be so dangerous? RUSS: Skating from 1958 to 2007 (49 years) has produced many good skaters. Picking a favorite skater is like picking a favorite friend; the decision isn't based solely upon ability alone. The entire person has to be considered: What positive contributions have been made? Were ethics always a priority? What was the character of the person? I have many skate friends who excel in all these categories: Bill Robertson, Daryl Grogan, Don Brown, Ed Nadalin, Edie Robertson, Ellen O'Neal, Francis Lavalee, George Douville, Gunter Mokulys, Guy Grundy, Henry Hester, Jim O'Mahoney, Joachim 'YOYO' Schulz, Kevin Harris, Steve Day, Terry Synnott, Ty Page, and many others. Is there anything you want to say that you haven’t been asked about? RUSS: Skateboarding has been an extremely important part of my life, but it has not been all my life. My goal within skateboarding was never to win, but rather to serve the sport in a way that would elevate others and help motivate them to become better in their own skating. I never allowed my decisions to be based upon greed; skating was too important to allow personal gain to interfere with important decisions that would have a ripple effect upon others on a global basis. There have been so many good friends made through the sport of skateboarding and I thank you all for helping to make my life a more pleasant journey. 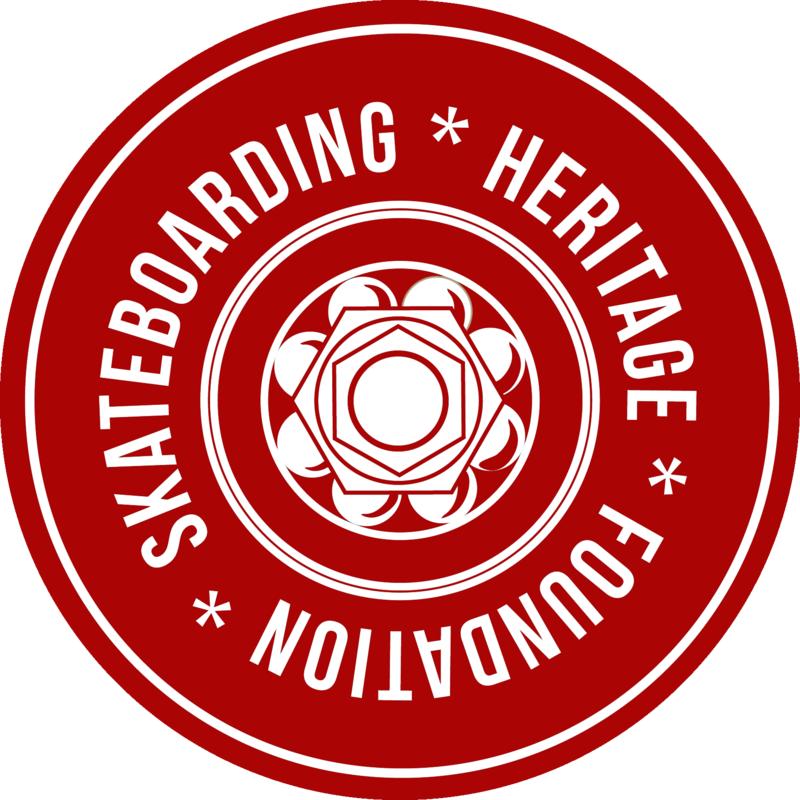 Financial support for the Skateboarding Heritage Hall of Fame and other SHF programs come from donations made by individuals and businesses such as yourselves. SHF is a non-profit organization and currently under application for Federal status as a 501(c) (3) corporation. Please consider donating. Click the PayPal link here to make a donation by credit card or PayPal, or visit the donate page for more information. CREDITS & THANKS: Text: copyright © Oldmanarmy.com. Photos: (top) Warren Bolster/courtesy of CalStreets.com; (second from top and bottom) Noel Forsyth/VicSkateHistory.com; (ads and book cover) courtesy of Russ Howell; (Howell autograph from 1975) courtesy of Downwinder, Australia.